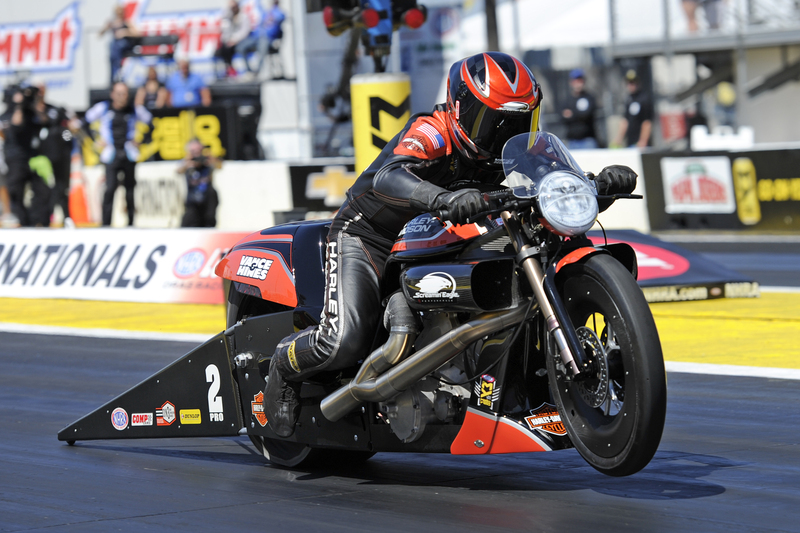 In Pro Stock Motorcycle t the 17th annual NHRA Toyota Nationals at The Strip at Las Vegas Motor Speedway, Oct. 29 category points leader Krawiec rode his Screamin’ Eagle Vance & Hines Harley-Davidson to a 6.924 at 193.16 defeating Hector Arana Jr. This is his third career victory at this event, seventh of the season and 43rd of his career. Krawiec’s road to victory was lined with wins over John Hall, Angelle Sampey and Scotty Pollacheck. The win puts him 150 points ahead of LE Tonglet who remains second. Arana Jr. rode past Katie Sullivan, Mike Berry and Tonglet. The NHRA Mello Yello Drag Racing Series concludes at the final event of the season at Auto Club Raceway at Pomona, Nov. 9-12, with the 53rd annual Auto Club NHRA Finals. FINAL — Krawiec, 6.924, 193.16 def. Arana Jr, 6.949, 192.91.